A recent report published by Infinium Global Research on smart city market provides in-depth analysis of segments and sub-segments in the global as well as a regional smart city market. The study also highlights the impact of drivers, restraints, and macro indicators on the global and regional smart city market over the short term as well as long term. The report is a comprehensive presentation of trends, forecast and dollar values of the global smart city market. 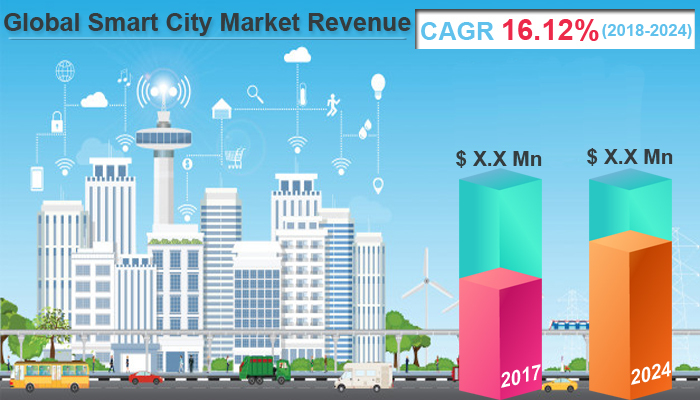 According to the report, the global smart city market is projected to grow at a CAGR of 16.12% over the forecast period of 2018-2024. The report defines Smart City that planned to support various human activities and make life comfortable. Smart City include components such as intelligent, sustainable, responsive and connected for enhancing the quality of life factors. The smart city is a label given to a city that uses various types of electronic data collection sensors to stream data used for resource efficiency and manages assets. Growing population coupled with increasing disposable incomes, particularly in developing economies is positively promoting the Smart City market growth. In addition, development in infrastructure and changing living of standard and lifestyle of the population are some factors are escalating the growth of the market. Implementation of an Internet of Things (IoT) and cloud-based services increasing adoption of these technologies to get connected which tend to drive the smart city market. Government taking initiative in the many countries for the development in infrastructure and adoption of smart transportation to reduce emission. Many developing countries are the lack of technological advancement which may hinder the growth of the global smart city market. Utilization of driverless cars and cyber-attacks due to the usage of connected devices may cause security concern which may hamper the growth of the market. Emerging network technology that is 5g will boost as an opportunity in the global smart city market. Increasing awareness for the environment and surging demand for the vertical planting for the green initiative are also opportunities for the market. Among the geographic, the North America region is exhibiting significant share in Smart City market during the forecast period. North America is the largest region for the adoption of emerging technologies and has high investment capital that drives the smart city market. Europe is projected to the second largest region for Smart City market during the forecast period. The Asia Pacific region is projected to expand at the highest CAGR over the forecast period. Rising disposable income, rapid population coupled with improving the standard of living is projected to boost the growth of Smart City market. In addition, government spending on housing projects and the growth in urbanization coupled with expanding IT industry is anticipated to positively impact demand. The first list of national pilot smart cities was announced by the Ministry of Housing and Urban-Rural Development of China in 2013, MOHURD. The growing number of major key players in the Smart City market in the Middle East and Africa has projected the growth with significant CAGR during the forecast period. The report on the global smart city market covers segments such as applications. On the basis of applications, the sub-markets include smart buildings, smart healthcare, smart security, smart homes, smart industrial automation, smart energy management, smart transportation, and others. The report provides profiles of the companies in the market such as Oracle Corp., Cisco Systems Inc., Intel Corp., International Business Machines (IBM) Corp, Hitachi Ltd., General Electric Co., Honeywell International Inc., ABB Ltd, Alcatel-Lucent SA, and Alstom S.A. The report provides deep insights into the demand forecasts, market trends, and micro and macro indicators. In addition, this report provides insights into the factors that are driving and restraining the growth in this market. Moreover, The IGR-Growth Matrix analysis given in the report brings an insight into the investment areas that existing or new market players can consider. The report provides insights into the market using analytical tools such as Porter's five forces analysis and DRO analysis of the smart city market. Moreover, the study highlights current market trends and provides forecast from 2018-2024. We also have highlighted future trends in the market that will affect the demand during the forecast period. Moreover, the competitive analysis given in each regional market brings an insight into the market share of the leading players.